To download TSA, click here. Analysis codes such as TRACE, RELAP5 and MELCOR each contain several distinct component types ranging from pipes, valves, pumps and vessels to heat structures and control systems. Each of these components may include several input options which control the behavior of the component along with it's input requirements. 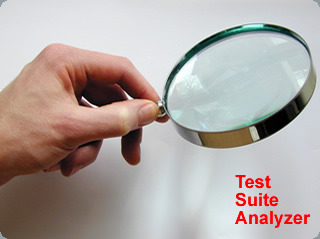 The Test Suite Analysis Tool (TSA) is designed to analyze a large set of input models for a given analysis code in order to provide a means of assessing the test suite coverage. TSA builds an embedded SQL databases customized to each analysis code from a metrics specification file which identifies all of the components, attributes and enumerations specific to the analysis code. TSA then imports a set of metrics files, each containing a snapshot of the testable component options for a given model. PLUGIN_NAME is the identifier for the code plug-in such as "TRACE"
A shell script can be created that will loop through a series of series of models, generating the batch commands required to import each into SNAP and then export the a metrics file. Once the metrics data has been loaded, TSA can be used to generate summary and detailed reports detaining the options that are included in the test suite. In addition, custom and freeform queries may be used to explore the data. UPDATE 2/17/2006: The TSA distribution has been updated. Corrected a problem in the generation of project statistics reports.